Abu Dhabi Sailing & Yacht Club will organizes YAS Dhow Sailing Race 22FT on Saturday 21/02/2015 Our Club invites all competitors to register for the race by coming to our club. Also, the club invites all lovers of Dhow sailing to follow watch our competition along the corniche near the breakwater. 22FT Dhow racing is the base of learning for this traditional sport. It is an important first step for young sailors aged 8-12 years. 22ft Dhow Sailing is an essential part of the UAE’s dhow sailing heritage. 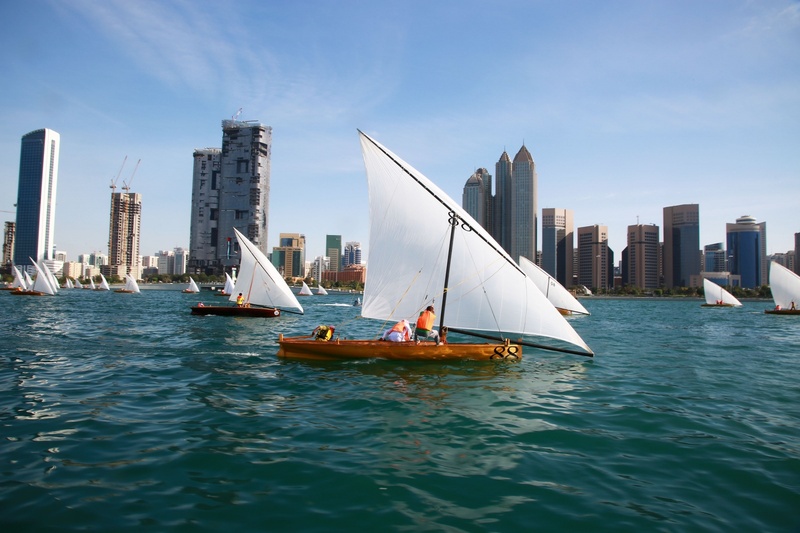 Racing in Abu Dhabi is hosted on the Corniche, with almost 60 dhows racing in front of the city. These traditional boats are made of wood and are rigged with one sail. Since the UAE National Day 2011 the sails carry the distinctive colors of the UAE flag. The crew consists of 3 sailors aged 8-12 & 1 skipper aged over 18. This way, the older and experienced skipper can teach and pass their skills onto the younger generation. Each race is held over a 6-10 nautical mile course, with three races to constitute the Championship. This program, organized by the Abu Dhabi Sailing & Yacht Club, aims to continuously encourage young sailors to continue the tradition of dhow sailing in the UAE.